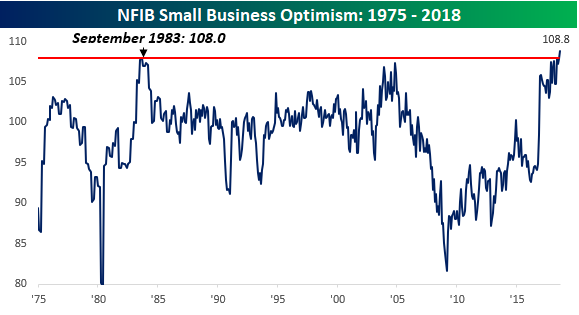 “Business is booming.” That statement was taken from the commentary section of the August NFIB report on small business optimism. In fact, business appears to be so strong for US small businesses that the index of Small Business Optimism rose to a record high of 108.8 in August. That surpassed the old record of 108.0 back in September 1983. While the record high in 1983 came just three years after small business sentiment in the US hit a record low, the current record high comes ten years after sentiment hit a generational low. One of the trends that stood out in this morning’s release was that 89% of small business owners looking to hire have found either no or few qualified applicants, indicating a pretty significant skills gap in the US economy. Given the lack of available qualified labor, a record 25% of small businesses cited Quality of Labor as the number one problem they face. 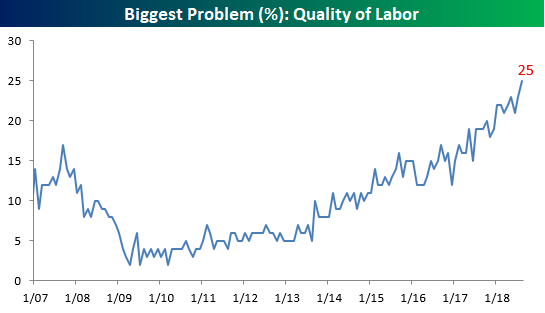 Of all the various ‘problems’ small businesses face, Quality of Labor is the biggest. 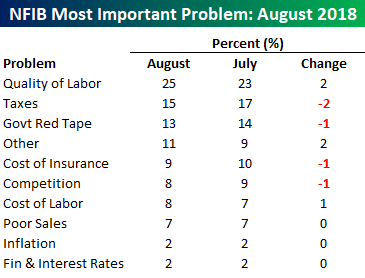 It wasn’t that long ago that issues like Taxes and Red Tape were the biggest issues, but they have now taken a backseat, and even after combining the two issues, they are only a slightly bigger (28%) problem than labor quality. Finally, while investors have been very concerned with upward price pressures this year, small businesses owners seem complacent with just two percent citing inflation as their number one problem.